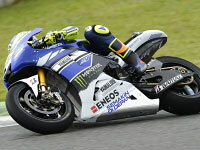 Yamaha Factory Racing rider Jorge Lorenzo kicked off day one of three of the final pre-season test of 2013 at the front, leading the MotoGP field by over a second in the timesheets. ? ?Following a successful team launch yesterday, today’s first day of action was a disappointing affair for the MotoGP riders with black clouds, heavy rains and a waterlogged track hampering testing efforts. Despite the adverse weather, Lorenzo managed to achieve 39 laps whilst working on the wet set up of his YZR-M1, achieving a competitive set up fairly quickly.? Valentino Rossi’s first day in the official 2013 colours of the Factory Team were similar to Lorenzo’s, the Italian working on his wet set up. Rossi was able to find a good pace but ended the session needing to reduce rear tyre wear in the wet to last race distance at a fast pace. The second day of the final pre-season MotoGP test was again played out in difficult weather conditions today with riders having to splash through a water-filled morning before being able to enjoy some dry track time later in the afternoon.? 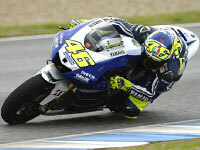 Valentino Rossi was finally given the conditions that allowed him to show his pleasure at being back on the YZR-M1. In the afternoon’s dry spell and on a European circuit he knows well, the nine-time Champion rose quickly to the top of the timesheets, staying there until the close of the day and reminding everyone that the special relationship between ‘the Doctor’ and the M1 has not lost its magic. Teammate Jorge Lorenzo, yesterday’s fastest rider in the wet, was just 0.015 seconds behind Rossi as today’s session ended, the reigning World Champion continuing to stay on the pace at the sharp end of the time scores.? Tech3 satellite rider Cal Crutchlow was next in the standings, making a Yamaha 1,2,3. A final day of complicated weather conditions restricting track action has signaled the end of pre-season testing for the MotoGP Championship at the Jerez de la Frontera Circuit in Spain. 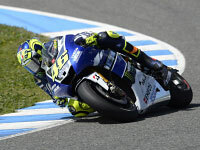 Despite reduced track time because of the conditions, both Valentino Rossi and Jorge Lorenzo leave Jerez satisfied with the YZR-M1 package and feeling competitive as the first race of the 2013 season approaches. Having climbed dramatically to the top of the timesheets yesterday for the first time in two years and sent a clear message that a new chapter had begun for him, Rossi put in another impressive ride this afternoon to leave the test second fastest in the combined times. Reigning World Champion Lorenzo had kicked off the Jerez test as the fastest man before spending the next two days working on honing his skill at delivering unbeatable pace over distance. He leaves as the third fastest rider, less than two tenths of a second from his teammate in second and making it a Yamaha one, two, three in the combined times.